When Lightroom mobile for iPad launched in April, Adobe brought a truly seamless RAW image editor to the mobile space, untethering photographers from their desktop and laptop workflows. Apple's tablet is well-suited for the task, with a high-resolution Retina display and ample screen real estate, but offering the same experience on a smartphone —even the capable iPhone 5 and iPhone 5s —would be pushing the envelope. 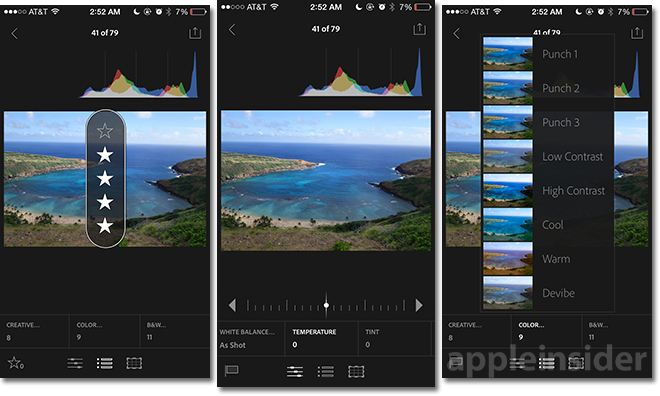 AppleInsider had a chance to spend some hands-on time with Lightroom mobile for iPhone and was pleasantly surprised to find a handheld version of what many photographers consider an important first step in their image editing and organization workflow. In fact, Adobe claims the iPhone version achieves feature parity with the iPad iteration. Making Lightroom feel at home on an iPhone is no small feat, and we wouldn't have been surprised to see features stripped away in an attempt to shoehorn the app onto a 4-inch screen. That is not the case, however. The iPhone version features the same impressive array of rich editing features found on the iPad, including cropping tools, image presets and fine adjustments like exposure, tint, contrast, white balance and more. Slider controls make for easy image modification, while a simple UI speeds up photo organization duties. 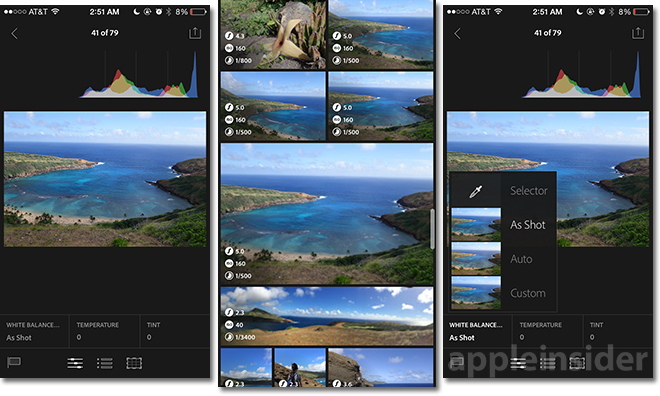 Bringing Lightroom to the iPhone meant a retooling of the app's user interface for the smaller screen, though the changes don't compromise the workflow. For example, elements like star ratings and flags get their own overlays and one-handed control, maximizing the app's abilities within a constrained space. Lightroom for iPhone makes the usual histogram, metadata, adjustment controls accessible from a main grid view with one or two taps. Scrolling through photos one-by-one, users can assign star ratings, make on-the-fly adjustments and more with one-finger operation. Alternate views and sub menus are accessed via a two or three-finger tap, tap-and-hold or similar gesture, hiding away text for an uncluttered view that puts photos front and center. The app draws from and saves to the iOS Camera Roll as well as Facebook, while every image adjustment is synced to Lightroom 5 for desktop, which was refreshed today to version 5.5 with new camera compatibility and support for star ratings and custom sort orders. 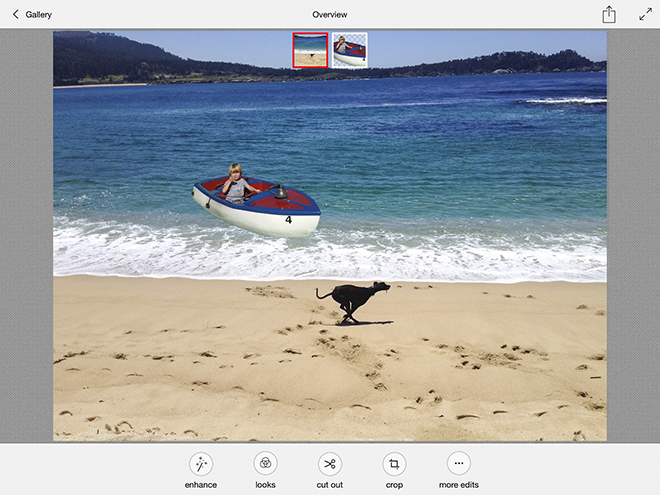 Developed using the new Adobe Creative SDK, Photoshop Mix is a purpose-built iPad app for users looking to cut out and stitch together multiple photos into a single Photoshop document. Adobe also includes image enhancements and other tools previously restricted to desktop versions of Photoshop. One of the more powerful features is an intuitive smart wand (a normal wand is also available for manual selections) that does a good job of parsing out objects of interest for non-destructive cutouts and image enhancements. Users can drag their finger around an image to make smart selections based on a number of image variables, usually resulting in a clean mask. The tool comes in handy for cutouts, which can then be combined with other photos to form layered composite images. Mix also includes three processor-intensive tools —upright, shake reduction and content aware fill—that rely on cloud computing to function. For example, we took the above panoramic image and used content aware fill to remove the people just below the island at the right. To accomplish the task, the app uploads the image to Creative Cloud, processes the selection in the cloud and sends the results back to Mix. Other edit options include "Looks," which are preset color adjustments that can be electively applied to an image via the smart or basic wand tools, while "Enhance" lets users change the exposure, contrast, clarity and saturation of a photo. An auto-enhance button is also available for speedier results. Finally, a basic cropping tool is also baked in with both preset ratios and manual handle controls. Any edits committed to the image can by synced back to Photoshop as layered and masked compositions for further refinement. Alternatively, the files can be saved to the Camera Roll or shared via email, Twitter, Facebook and iMessage. Mix also has hooks in Adobe's own Behance social network. Adobe is currently offering a 30-day free trial for Lightroom mobile and Photoshop Mix. Both products were officially unveiled by the company on Wednesday.